The Sheraton New York Times Square Hotel is a Sheraton hotel located in New York City near Times Square. It faces 7th Avenue, West 52nd Street, and West 53rd Street. At 152.7 m (501 ft), it is one of the world's top 100 tallest hotels, and one of the tallest hotels in New York City; it has 51 floors. The hotel was completed in 1962 as The Americana of New York. It was built, along with the adjacent New York Hilton, to serve the huge number of tourists that the 1964 New York World's Fair would bring. The hotel was constructed by Laurence Tisch and Preston Tisch, co-owners of the Loews Corporation. The hotel was renamed Loews Americana of New York a few years after opening. Loews sold the hotels in the Americana chain, with the New York property going to Sheraton in January 1979. It was renamed the Sheraton Centre Hotel & Towers. After a nearly $200 million renovation in 1991, the hotel was again renamed the Sheraton New York Hotel and Towers. 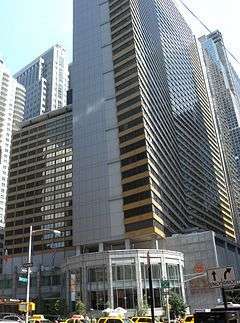 It was again renovated in 2012–13, with the name shortened to Sheraton New York Hotel in 2012 and then changed to Sheraton New York Times Square Hotel in 2013. In its original form the hotel incorporated five restaurants and no less than ten ballrooms. While designing the hotel, architect Morris Lapidus became involved in a dispute which led to his resignation from working also on the neighboring New York Hilton project. The 152.7 m (501 ft) hotel has a plan, less typical for its age, with a bent slab shape. The facade consists of horizontal striping of steel-framed windows and yellow glazed brick facing. Lapidus used the bending slab style earlier in NYC in his 1961 Summit Hotel, on Lexington Avenue. At the time of its completion, the building was the tallest concrete-framed structure in the city. Its unusual frame system consists of three zones: floors 1 through 5 were supported by steel-concrete composite columns, floors 5 through 29 by concrete sheer walls and 29 to 51 by reinforced concrete columns. On the north side is a 25-story wing located above the entrance and the glass-walled lobby. The Seventh Avenue sidewalk has a striped paving that extends around the semicircular rotunda that extrudes from underneath the west end of the slab. ↑ "Sheraton New York Times Square Hotel". CTBUH Skyscraper Database. ↑ "Sheraton New York Times Square Hotel". SkyscraperPage.